This is a new favourite of mine! Delicious, healthy and quick to make! But not only that, the thing I like most about pasta primavera is you can use whatever spring vegetable you fancy most - no strict guidelines....Ok, I know it's not spring right now but these vegetables are actually available year 'round, so whatever. He he! Although this pasta has an Italian name (and it is PASTA after all), it is not actually and Italian dish. This is an an Italian-American dish. Who knew!? Anyway, back to the matter at hand.... Pasta Primavery, yes, super delicious, simple, healthy, excellent when you're hungry but don't want a heavy meal. - In the mean time heat half the olive oil in a pan, add broccoli and carrots. Heat through for about 1 minute then add all remaining ingredients. Cook on medium heat for about 3-5 minutes. 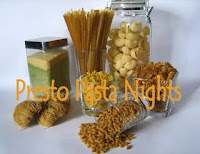 This will be my entry for this week's Presto Pasta Nights, hosted by the founder herself, Ruth Daniel's from Once Upon a Feast! Delicioso! I love how this is based on an olive oil sauce instead of a cream sauce, as some primavera sauces are.